Log Cabin 1 br + Loft, full bath with jacuzzi, and kitchen. Sleeps 1-4 persons. 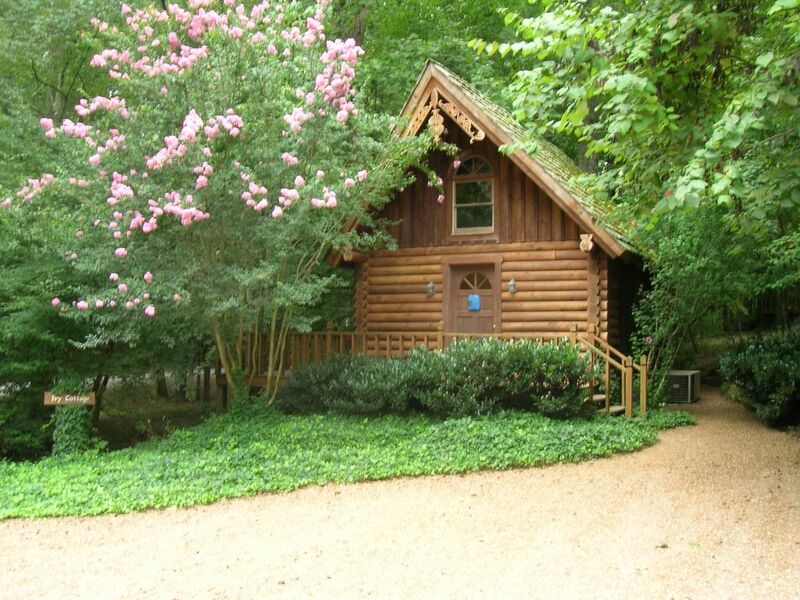 The Ivy Cottage is our smallest and most affordable log cabin. This adorable 450 square foot two-story log cabin makes no concessions when it comes to comfortable furnishings and charm. It's really got everything you need. This cabin is very popular with business travelers, couples, and small families. The downstairs bedroom has a double bed with a 19 inch flat screen TV, DVD player, and movie collection. This is the only TV in the cabin. Additional sleeping is available on two twin beds located in the loft, which is accessed by a ' ship's ladder '. A word of warning, the upstairs may be unsuitable for very young or rambunctious children. The living room is small but is made very comfortable with 2 wing-back chairs, and one has an ottoman. The cottage has central heat and air conditioning. The kitchen has a table for two, stove/oven, single basin sink, toaster, microwave oven, coffee maker, and a small refrigerator that fits underneath the kitchen counter. There are dishes, cooking, and eating utensils. There is a park style charcoal grill outside. The bathroom has a full size shower/tub combination with whirlpool jets and a single basin sink. We believe that you will find the furnishings very pleasing right down to the hand carved "kissing squirrels." A large deck wraps around two sides of the cabin and provides additional 'outdoor living space'. Just outside of your bedroom door you'll hear the sounds of the creek tumbling by on it's way to the Ocoee River. The deck features reclined bench seating positioned around a patio fireplace, and a table with chairs for outdoor dining. Winter rentals enjoy 2 free bundles of firewood per night. Additional firewood can be purchased for $5/bundle. Across the gravel driveway you'll see multiple flower gardens, a nice grassy field for sports, horse shoe pit, basketball court, and a creek for exploring. It is about a 1 minute walk down to our riverside pavilion and swimming/fishing dock. The river is controlled by the Ocoee No. 1 Dam, and is subject to changes related to water releases. Typically mornings provide a placid river about 3' deep with little to no current. You can easily spot fish and see the bottom. Swimming is easiest during this time of day. In the afternoons water releases will raise the level of the river to about 6' and the current becomes quite swift. Competent swimmers can still swim during this time if you stay close to the shore. The river becomes deep enough to jump off of our dock during these high water periods. Wildlife commonly seen along the river include Great Blue Herons, Kingfishers, wild ducks, bald eagles, river otters, coyotes, raccoons, and of course fish. We even saw a deer once swimming in the river! We have been offering our Ivy Cottage for nightly rentals for 22 years and enjoy lots of repeat guests. Some of our previous guests comments for Ivy Cottage include 'One of the most beautiful peaceful places that we have ever been to...', 'This was one of the many great surprises my husband has given me over the years...', 'We had such a great time on our honeymoon! The Ivy Cottage cabin, fireplace, and atmosphere was an added touch to a stress free vacation. We can't wait to come back...', 'absolutely incredible! I was taken aback with the beauty and atmosphere of this cabin! ', 'Total perfection in a small package'. We are Kevin and Jenny Rogers. We are both Tennessee natives and graduates of the University of Tennessee at Knoxville. We have a 21 year old son, two dogs, and two cats. We love the outdoors and have enjoyed sharing our beautiful Ivy Cottage cabin with guests over the past 24 years. We are Owner/Operators who live onsite, and we pride ourselves on customer service. Ivy Cottage was built as a retreat by Jenny's late mother Warnie Elizabeth Dooly Finnell. She lived and worked in Cleveland, and came to Ocoee for rest and play. She visualized Welcome Valley Village as a means to share this special place with others. Ivy Cottage is convenient to the beautiful Ocoee Region of the Cherokee National Forest where we enjoy scenic drives, photography, kayaking, hiking, backpacking, swimming, and mountain biking. We enjoy floating from the Ocoee Dam to our property in the summer. When we feel like a little city life we travel about 45-50 minutes to Chattanooga where we can enjoy shopping, great restaurants, the TN Aquarium, live music and art festivals, University of Tennessee events, minor league baseball games, scenic river cruises, and so much more. Also, Cleveland and Lee University are just 20 minutes away for shopping and lots of restaurants. The best thing about Ivy Cottage is that it so dang cute. Round logs, exposed rafters, the loft, simple wide plank floors, tasteful decor, and that's just the inside. Step out of the bedroom onto a deck with fireplace, and the sounds of a creek below. Some of our guests enjoy the simple beauty of their cabin and surroundings, rarely leaving our property. Enjoy a fire on the patio, read, tell stories or just listen to the night sounds. Take a stroll around our 17 wooded acres, cast a line for trout or bass, turn over rocks in the creek to find salamanders, take a swim in the river, or just watch it roll by from a dock chair. Ivy Cottage is perfect for those who don't want to stay in a hotel or hear 'city sounds' in the evening. There is absolutely no comparison! Check us out. We enjoy going to the 'big' cities of Cleveland and Chattanooga, but I'd rather go to sleep and start the day here at Ivy Cottage. Two Grocery stores and several restaurants are available within 10 minutes from the cabin. Lavatory, toilet, whirlpool tub and shower. Ivy Cottage is at Welcome Valley Village, a 17 acre riverside retreat on the Ocoee River. We offer nightly rentals in 5 log cabins on the property. Cabins are widely spaced for privacy. From our street you will see the 2000'+ mountains in the Cherokee Nat'l Forest just to the east about 1/2 mile away. Our cabin is creek side in Todd Hollow, so it is in a low lying, yet hilly, area. Ivy Cottage is next to a creek, and is a 1 minute walk to our riverside pavilion and dock on the Ocoee River. No phone in the cabin, but most cell phone providers have service here. Fresh linens are provided for all beds. No daily housekeeping. There is a patio fireplace on the deck outside, next to the creek. Firewood is $5/bundle. Winter rentals get 2 bundles/night included in rent. Plenty of room for 2 cars at the cabin. Kitchen and bath towels are provided. Nice ones! Free WiFi; "Welcome Valley Guest" Network, no password required. Speeds are good. Living room is very small. Has 2 wing-backed chairs, and 1 ottoman. Table with lamp in between. TV is in the bedroom. Kenmore 3.0 cu. ft. capacity; fits underneath the counter; the freezer space is pretty small. You may want to bring a cooler for additional storage space if you are staying several nights. All dishes & utensils are provided. Kitchen is compact but has everything that most people need including a 20" range, single basin sink, small fridge, toaster, microwave oven, coffee maker (and filters), cooking & eating utensil. Small dining table for 2. There is also a table with 4 chairs on the deck. 26' Sony TV. No cable or satellite but we normally receive about 12 channels including ABC, NBC, FOX, and PBS. We provide a collection of DVDs. About 20 movies are kept in the cabin. There are about 20 movies kept in the cabin. There are trails and flower gardens all around the cabin. Also a grass playing field with horseshoes and basketball court. There is a deck on the front and side of cabin. The bedroom door opens onto the deck and the creek is just below. There is a table with chairs, reclined bench seating and a wood burning patio fireplace. In Cleveland at Lee University and public parks. Chatata Valley Golf Course is about 15 minutes away. It’s a cozy and cute cabin! My 9 and11 year old girls loved this cabin. It is very cozy. The owners are very nice, and their doggies are part of the attractions. Thanks for taking time to post your comment. Hopefully you'll have better weather the next time you come; it's too bad that your horseback riding trip was cancelled. Beautiful property, pristine kept cabins and land. The cottage was as immaculate as its surrounding acreage and so charmingly decorated for Christmas. As noted by other reviewers, it is much warmer and prettier in person. We will return during the summer to enjoy the river, hammocks, and chiminea. Thank you to Kevin and Jenny for your thoughtful attention to comfort. This place is beautiful! The area is perfect for a relaxing time! Enjoyed The hammock, nature trails and the sight seeing that is anywhere you drive! 💕I definitely will be returning! Located close by are opportunities for glider-plane rides/instruction, tree-canopy ziplines, boat rentals on Lake Ocoee, whitewater rafting on the Ocoee and Hiwassee Rivers, wineries, scenic train rides, sporting clay shooting, fishing, hiking, mountain biking, swimming, tubing, and one of the largest gun stores in the south. We are 45-55 minutes from Downtown Chattanooga which is a two-time winner of Outside magazine's "Best Town" title. There is a 2 NIGHT MINIMUM booking required during Summer and on all weekends, UNLESS only 1 night is available in between reservations. Some holidays have a 3 night minimum. ONE NIGHT RENTALS ARE considered on Sunday-Thursday nights during all other seasons at our discretion. A booking of 5 or more nights will receive a 10% discount off of the published rates. Base rates cover up to 4 guests. Additional guests are $5/child (2-17yrs)/night or $10/adult/night. We do not take a cash damage deposit upfront, rather you must provide a credit card to imprint at check-in as a Security Deposit. Extra charges for damages are extremely rare.